Copyright: © 2017 Perinjelil V, et al. This is an open-access article distributed under the terms of the Creative Commons Attribution License, which permits unrestricted use, distribution, and reproduction in any medium, provided the original author and source are credited. Penetrating neck injuries contribute significantly to mortality despite accounting for a small percentage of penetrating trauma overall . Out of all penetrating neck injuries, 25% result in an arterial injury with 80% involving the carotid arteries and 43% involving the vertebral artery 1. Reports of isolated or mixed vessel PNIs are associated with significant morbidity or fatality [2-4] Mortality resulting from extracranial penetrating arterial trauma has been demonstrated to reach 21.2%  and morbidity related to these injuries often result in severe neurologic deficits if the injured vessel is ligated rather than repaired 3. We highlight the case of a patient surviving after sustaining a stab wound to the left neck resulting in complete transection of the left common carotid artery (CCA) proximal to the take-off the left internal carotid artery (ICA) and external carotid (ECA), near complete transection of the left IJ, and near complete transection of the LVA. A 23 year old African American male was brought to our emergency department (ED) after being stabbed in the left neck. American Trauma Life Support (ATLS) management was initiated. Upon presentation, patient was noted to have a Glascow Coma Scale (GCS) score of 5 with obvious arterial hemorrhage from the left neck. Stab wounds over the left neck involved all three zones. Airway was secured via endotracheal intubation. Patient already had left chest needle decompression performed by emergency service (EMS) personnel followed by chest tube placement due to loss of breath sounds and presumed pneumothorax. Patient’s presenting vital signs were as follows: blood pressure of 118/74, heart rate 141, respiratory rate of 22, with an oxygen saturation of 100%, and temperature of 36 degrees Celsius. After obtaining intravenous (IV) and intraosseous (IO) access, patient was transfused with packed red blood cells (PRBCs) and fresh frozen plasma (FFP) following a 1:1 ratio. According to our massive transfusion protocol (MTP) patient also received 1 gram of tranexamic acid (TXA). Patient was immediately transported to the operating room (OR) for exploration and hemorrhage control. Upon surgical exploration of the neck wound, patient was found to have near complete transection of the left IJ and complete transection of the left external jugular (EJ). He was also noted to have a complete transection of the left CCA just below the bifurcation of the left ICA and ECA. Proximal vascular control of the CCA was obtained, however distal control from the left ICA and ECA was challenging given its retraction high in the neck. Once distal vascular control was obtained, it was decided given patient’s hemodynamic instability to ligate the proximal and distal carotid arterial ends with the same done for the jugulars. After ligation of aforementioned vessels, patient transiently responded to the ongoing blood product administration, however significant new bleeding was noted from deep within the left neck. After a challenging dissection to the deep left cervical region, the bleeding was originating from the cervical vertebral canal consistent with left VA injury. After multiple unsuccessful attempts to control the bleeding from the left VA using various Fogarty balloons, the vertebral canal where the hemorrhage was noted was tightly packed with EVARREST® (Ethicon, Inc.). After surgical intervention patient had a formal cervical angiogram which revealed occlusion of the distal l left CCA with no flow through the left ICA and ECA, and occlusion of the left VA with no active bleeding noted (Figure 1A and 1B). 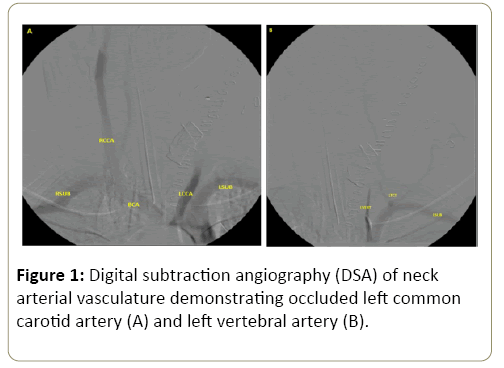 Figure 1: Digital subtraction angiography (DSA) of neck arterial vasculature demonstrating occluded left common carotid artery (A) and left vertebral artery (B). 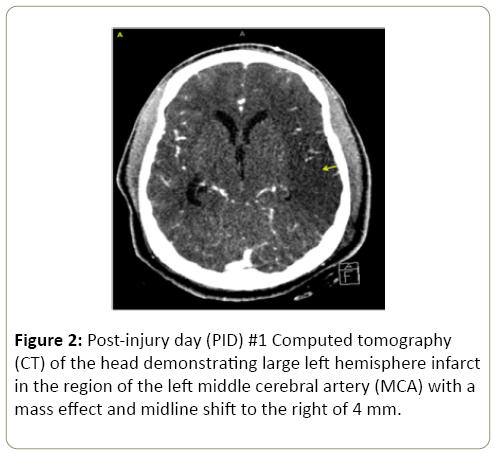 On post-injury day (PID) 1, patient had a computed tomography (CT) of the head which revealed a large left hemisphere infarct along the region of the left middle cerebral artery (LMCA) (Figure 2) with associated 4 mm shift to the right and intraventricular bleed. On PID 2, patient was noted to have a significant change in left pupillary size from 2 mm to 8 mm. Repeat CT of the head revealed increased mass effect from the large left MCA territory infarct, with a left to right midline shift measuring 0 mm with other findings of increasing herniation (Figure 3). Patient was taken emergently for decompressive craniectomy, re-exploration of the left neck surgical wound, and tracheostomy tube placement. No active bleeding was noted from the ligated vessels and from the tamponade vertebral canal. Patient’s surgical intensive care unit (SICU) course was complicated by complex seizures, left femoral deep vein thrombosis (DVT), and bacteremia. Due to his dysphagia patient had a feeding tube placed for long-term nutritional access. Patient underwent physical, occupational, and speech rehabilitation. Eleven weeks after initial injury patient had cranioplasty of the left frontotemporoparietaloccipital craniectomy defect using the bone flap stored in the anterior abdominal wall. Patient was ultimately discharged home with improving right upper and lower extremity strength, however still requiring intense physical, occupational, and speech therapy. Figure 2: Post-injury day (PID) #1 Computed tomography (CT) of the head demonstrating large left hemisphere infarct in the region of the left middle cerebral artery (MCA) with a mass effect and midline shift to the right of 4 mm. Figure 3: PID #2 CT of head revealing increasing mass effect from left MCA territory infarct with midline shift to the right of 10 mm. PNIs involving the cervical vasculature are among the most lethal traumatic injuries. Basic management of these complex injuries consists of prompt and effective control of hemorrhage and adequate resuscitation. Reported incidence of PNI to neck with associated carotid artery injury is approximately 6% . The neck has been divided into 3 zones for better evaluation and approach of injury  (Table 1). Table 1: Management of Neck Injury by Zone. *Ligation of the carotid artery can be considered in cases of refractory hypotension with systolic <70 mmHg, unconsciousness and bilateral mydriasis, associated gunshot wound to the brain, very severe neck injury, or high zone III injuries . A zone based approach for the management of PNIs is valuable as it allows the surgeon to better plan for adequate surgical exposure (Table 1) [9,10]. However, over the last two decades management of PNIs has shied away from a zone based approach to an approach based on presenting clinical signs and CTA6 . A "no zone" based approach involves the recognition of hard signs- active hemorrhage, expanding hematoma, and massive subcutaneous emphysema- which mandates surgical exploration. On the other hand, soft signsdysphagia, hoarseness, voice changes, stable non-expanding hematoma, hemoptysis, and subcutaneous emphysema- which would then require CTA with a confirmatory test such as laryngoscopy, bronchoscopy, esophagoscopy, and conventional angiography only if the CTA demonstrates an injury. This has led to a decrease in unnecessary neck explorations, especially for Zone II injuries. Surgical management for a penetrating CA injury consists of primary arteriorrhaphy or end-to-end anastomosis, interposition vein or polytetrafluoroethylene (PTFE) grafting, or transposition of the ECA to injured ICA9. Surgical ligation still remains a management strategy when there is significant injury to the CA. Navsaria et al in 2002 and subsequently Reva et al in 2011 set forth some indications for CA ligation (Table 2) . According to Reva et al, one of the factors determining CA injury outcome was associated with type of operation performed. CA ligation resulted in a 44% mortality rate and severe post-operative neurological damage in 56% of patients. Table 2: Indications for CA ligation due to PNI [8,11]. Management of IJV lacerations are best approached by lateral venorraphy, end to end anastomosis, and saphenous interposition graft . Complications that can arise from IJV ligation include transverse sinus thrombosis and increased intracranial pressures . Tamponade and packing comprise the primary management of vertebral artery injury for urgent hemostasis followed by direct repair or stenting to a lesser degree . While algorithms provide a guide for optimal and minimally invasive approaches, surgeons rely on both clinical suspicion and operative exploration. Sufficient collateralization allows perfusion in neck injuries before definitive management is identified. In cases where jugular veins are severed, venous drainage can route to the vertebral venous plexus. In a case report of a patient who had ligation of right internal and external jugular vein, the left jugular vein took over the drainage. After ligation of bilateral internal and external jugular veins, extensive venous collaterals in the skull base and inside the neck muscles drained into right and left subclavian veins at the cervicothoracic junction . Venous outflow can be obstructed by ligation of the jugular veins potentially leading to pseudotumor cerebri. Increased intracranial pressures in these patients present with cardinal features like visual field defects and papilledema. In cases of carotid occlusion, improvement of circulation has been achieved by collateral circulation through the Circle of Willis by way of the internal maxillary artery and the facial artery with the ophthalmic artery . The internal carotid artery and vertebral/basilar arteries are connected by the Trigeminal, Otic and Hypoglossal arteries. Any of these can also provide collateral blood supply to the carotid artery if there is stenosis or severance, as in this case . When the external and internal carotid arteries are unable to carry their normal blood supply, branches of the ophthalmic artery help with survival. In our patient, flow from the right VA and the posterior cerebral artery allowed circulation to continue even with the severed vessels. Though the patient suffered a MCA stroke, his symptoms progressed less rapidly than a normal stroke patient. We can infer that reconstitution of neck flow was most likely due to the posterior cerebral artery supplying the MCA 15. While knowledge of collateral pathways are limited, neuroimaging allows us to understand the network of channels that stabilize blood flow when perfusion is needed. In another patient who had a penetrating neck injury to the common carotid artery, there was collateral circulation between the right vertebral artery and right common carotid artery/subclavian artery. The researchers concluded that ligation of vessels in neck is preferred in cases of severe shock with refractory hypotension . The Annals of Surgery in 1978 reported that with carotid artery penetration, revascularization and ligation of the vessel have similar outcomes in comatose patients . One report of a patient following a slice injury to the right neck resulted in transection of right internal and external carotid arteries . 2 days after ligation of the internal and external carotid arteries, the patient passed away. Teehan et al reported that patients with repair of vessel injury did significantly better than those with vessel ligation, but that no difference exists in comatose patients. Thus they concluded that carotid artery injuries should be repaired in patients with normal neuro evaluation and GCS >9, but those with GCS<8 do poorly regardless of treatment. PNI are amongst the most lethal traumatic injuries. Surgical management of vascular injuries to the neck, especially the CA consists of primary repair or revascularization strategies. However, while ligation of vessels are typically associated with poor outcomes this still remains a surgical strategy in life threatening situations. Morbidity of ligating the carotid artery is dependent on collateral cerebral circulation. IJ ligation in general well tolerated, however it can be associated with transverse sinus thrombosis and increased intracranial pressures. Tamponade of the VA with hemostatic agent is an acceptable surgical management followed by prompt angiographic evaluation. Penetrating neck injuries still pose serious challenges for treatment however focusing on surgical therapy and management strategies will facilitate more efficient approaches to their evaluation. In order to understand treatments achieving optimal outcomes in traumatic stab wounds and collateral circulation conduits, further analysis and reviews are essential. Our research did not receive grant funding from funding agencies in the public, commercial, or not-for-profit sectors. Authors would like to acknowledge the division of trauma surgery at Hurley Medical Center for their support and assistance. Sethi RK, Kozin ED, Lee DJ, Shrime MG, Gray ST, et al. (2015) Epidemiological Survey of Head and Neck Injuries and Trauma in the United States. Otolaryngol Head Neck Surg 5: 776-784. Tannoury C, Degiacomo A (2015) Fatal Vertebral Artery Injury in Penetrating Cervical Spine Trauma. Case Rep Neurol Med 2015. Lin HL, Lin YK, Kuo LC, Lee WC, Chen CW, et al. (2008) Damage Control in the Transection of Carotid Artery -A Case Report.Am J Emerg Med 26: 841. Marston AP, Montenegro MM, Oldenburg MS, Thom JT, Driscoll CL, et al. (2016) A Unique Case of Penetrating Neck and Cervical Spine Trauma Resulting in Vertebral Artery Transection and Internal Carotid Artery Laceration. American Journal of Otolaryngology 37 3: 199-201. Du Toi DF, Van Schalkwyk GD, Wadee SA, Warren BL (2003) Neurologic Outcome after Penetrating Extracranial Arterial Trauma. Journal of Vascular Surgery 2: 257-262. Demetriades D, Asensio JA, Velmahos G, Thal E (1996) Complex Problems in Penetrating Neck Trauma. Surgical Clinics of North America 4: 661-683. Weireter J, Leonard J, Britt LD (2016) Penetrating Neck Injuries: Diagnosis and Current Management. Inc. Current Therapy of Trauma and Surgical Critical Care 179: e204. Reva VA, Pronchenko AA, Samokhvalov IM (2011) Operative Management of Penetrating Carotid Artery Injuries. European Journal of Vascular Endovascular Surgery 1: 16-20. Lee TS, Ducic Y, Gordin E, Stroman D (2014) Management of Carotid Artery Trauma Craniomaxillofacial Trauma Reconstruction 7: 175–189. Prichayudh S, Choadrachata-anun J, Sriussadaporn S, Pak-art R, Sriussadaporn S, et al. (2015) Selective Management of Penetrating Neck Injuries Using “No Zone” Approach. Injury 9: 1720-1725. Navsaria P, Omoshoro-Jones J, Nicol A (2002) An Analysis of 32 Surgically Managed Penetrating Carotid Artery Injuries. Eur J VascEndovasc Surg 4: 349-355. Rowland SP, Dharmarajah B, Moore HM, Dharmarajah K, Davies AH, et al (2014) Venous Injuries in Pediatric Trauma: Systemic Review of Injuries and Management. J Trauma Acute Care Surg 77 2: 356-363. Brook CD,Buch K, Gadaleta D, Jalisi S, Grillone G, Sakai O, et al. (2015) Changes in The Jugular Bulb Associated with Sacrifice of The Internal Jugular Vein. Otology and Neurotology. 35: 146-150. Guan Q, Chen L, Long Y, Xiang Z (2017) Iatrogenic Vertebral Artery Injury during Anterior Cervical Spine Surgery: A Systematic Review. World Neurosurgery 106: 715-722. Ensari S, Kaptanoglu E, Tun K, Gun T, Beskonakli E, et al. (2008) Venous Outflow of The Brain after Bilateral Complete Jugular Ligation. Turkish Neurosurgery 1: 56-60. Liebeskind D (2003) Collateral Circulation. Stroke 34: 2279-2284. Babu A, Garg H, Sagar S, Gupta A, Kumar A, et al. (2017) Penetrating Neck Injury: Collaterals for another Life after Ligation of Common Carotid Artery and Subclavian Artery. Chinese Journal of Traumatology 1: 56-58. Teehan EP, Padberg FT, Thompson PN, Lee BC, Silva M, et al. (1997) Carotid Arterial Trauma: Assessment with the Glasgow Coma Scale (GCS) as a Guide to Surgical Management. Cardiovascular Surgery 2: 196-200. Liekweg WG, Greenfield LJ (1978) Management of Penetrating Carotid Arterial Injury. Annals of Surgery 5: 587-592. Sperry JL, Moore EE, Coimbra R, Croce M, Davis JW, et al. (2013) Western Trauma Association Critical Decisions in Trauma: Penetrating Neck Trauma. Journal of Trauma and Acute Care Surgery6: 936-940.